Power steering, tie rods, and ball joints….oh, my! Ok…i spent more time custom fitting tools today than actually turning wrenches! I eventually found the socket I needed, but I had to buy a set of 1/2 inch impact drivers to get it. 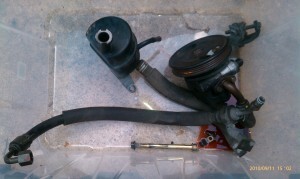 Then I had to grind to socket short so it would fit between the power steering pump and the oil pan. 4 hours start to finish to remove that one stupid fitting. See that stupid fitting down there? The one circled in red? That is the evil fitting, and the source of my frustration for the day (okay the first source). The fitting head is 22mm, and it is pretty close to the oil pan. I didn’t know it was 22mm, I only knew it was “close” to 7/8″. I didn’t HAVE a 22mm socket. I knew that my 7/8″ 12-pt fit pretty well. 7/8″ is 22.265mm…I figured 22mm was probably right, but wanted to get a 23mm to be sure I had the right size. My metric set stopped at 19mm, a common stopping point I would find. I found lots of socket sets that all stop at 19mm (20+ is pretty rare at the standard places). Also notice that the head is smaller than a typical bold head. I don’t know why. It made it impossible to use anything other than a 6-point wrench of some kind. I tried a crescent wrench, wouldn’t fit because it interfered with the steering rack mounting bracket. I tried a Klinex adjustable wrench (it has square jaws that grip the corners). I gripped fine, but I just couldn’t get a good angle to apply enough torque, and hold the jaws tight. So, off to the store. I tried O’Reilly first, because they are closest. They had an impact set, but it only went to 22mm…as I said above, I wanted 22 and 23 to be sure. On to autozone, they didn’t have anything even 22mm. Lowes? Yes, lowes had a deep socket impact set (11mm – 23mm or something like that) for $50!! 1. I knew there wasn’t room for the deep sockets, 2. I wasn’t paying $50 when I only needed one socket! Home Depot? Pointless…I don’t know what I was thinking even going to look. Ace Hardware, maybe. Nope…selection was as bad or worse that HD. By now, I’d made a loop around the entire east McKinney / Princeton area. I was close to another O-Reilly. Maybe this one will be different? Well, no. But, they also have the impact socket set that I’d passed-up at the first place. FINE! I bought it, and hoped the bolt was not 23mm. I was “in luck”…or at least lulled into thinking so. When I got home the 22mm socket fit perfectly. …sorta. 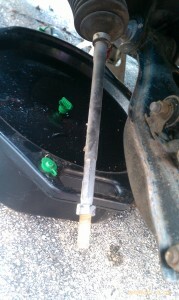 The fitting is not THAT close to the oil pan, but it was close enough that an impact fitting was about 3/16″ too long with the wrench attached. Plus, because the bold-head was so shallow the tapered transition of the socket made it so that it just barely gripped the head. Okay fine. Two birds, one stone. To the grinder. I left the socket attached to the wrench, and carefully ground the socket down (in length)…slowly turning the socket to keep things even. It took about an hour of grinding, and cooling, and grinding, and cooling, and test fitting, and grinding, and cooling, and grinding, and cooling….okay you get the point. It took a while, being careful not to overheat the part. Anyway, I finally got it down to size, and removed the fitting. It loosened in about 1/8th of a turn. Then it was immediately finger loose, and I removed it. All told, from when I first tried to remove the bolt…through the trips to all the stores, grinding down to size, and finally removing the bolt? 4 hours. Stupid bolt. Back on task, turn the rack back and forth about 10 times until all fluid stopped coming out. Put in the very nice plugs from Advanced Autosports. Job number 1….DONE! Next, time to remove the pump bracket. 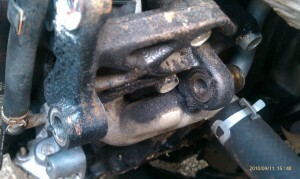 As Dave Wheeler mentions in his book, there is a bolt hidden behind the bushing on the rear of the mounting bracket. A cold chisel and a hammer make quick work of moving the bushing out of the way. Bushing moved…provides access to the nut. Out she comes! Looks much cleaner without the A/C and the P/S pump, plumbing, and reservoir (did YOU know there is an “r” in the middle of reservoir…I didn’t…couldn’t figure out what spell-check wanted…I was typing resevoir). Can’t wait to get rid of the stock air-cleaner box. But, that is not on the list today….<sigh>. 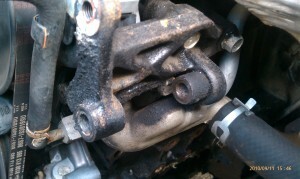 Here are all of the parts removed from the power steeting: pump, bolts, brackets, plumbing, and reservoir. I haven’t weight it, yet. Well, that took care of the power steering conversion. Next up? 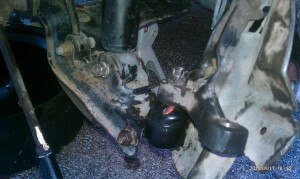 Lower ball joints, tire rod ends, and upper ball-joint dust cover replacement. I started with the Driver’s side. The tie rod was easy. Remove the nut, use a tie-rod splitter, and blammo! off it comes. In hindsight, it would have been a tad easier to loosen the tie-rod jam-nut before-hand. But, it wasn’t frozen (thankfully), and it came off easily with two wrenches. I used white-out to mark the position of the nut. 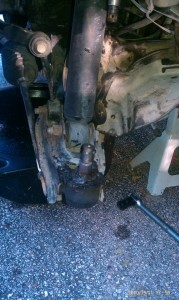 I did discover that my passenger side tie-rod boot is cracked. I didn’t notice on my initial inspection before ordering parts from Mazda. Oh, well. Another order. Next, up the lower ball-joint. I decided to disassemble everything before reassembling any sub-parts. This was not quite like the tie-rod end! I used a ball-joint spliter, but it just wouldn’t budge. It seemed like the the splitter wasn’t making solid contact with both sides of the joint. So, I pulled the splitter out and looked at it. It was made just by bending a piece of metal into a U-shape. This caused the “U” part of the bend to bulge. This bulge had dig-marks where the sides of the joint were digging in and preventing the wedge from sliding into the joint any further. Back to the grinder. I ground the sides of the tool until the wedge was smooth and flat. It was just at the limit of my grinder. It took about 30 minutes to grind it nice and flat. Once I got back to the car, I tried again. Something still wasn’t right. I began experimenting with different angles of attack, and positions of the tool. I finally found one that let the tool slip in about 1/4″ further. I hit it with the hammer and it made a much more solid thunk! Another slight adjustment, several more thwacks with the hammer. Voila! No I know how to do the passenger side, tomorrow. 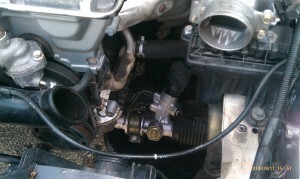 Next, I’m replacing the upper ball-joint dust boot, so…same procedure. This one came apart without any fight. A simple screw-driver to remove the upper dust boot. Finally, the knuckle is removed. Time to remove the lower ball-joint. Yet another fight! Not as big, but there are two bolts holding the ball-joint to the lower A-arm: A through bolt that that goes through both sides of the A-arm and the ball joint. This one is easy, remove the nut, and push it out with a cold-punch. Then there is one that passes through the upper surface of the A-arm and down into the threaded hole in the ball-joint. 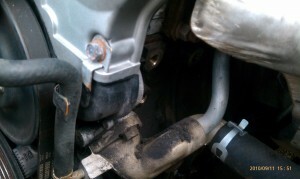 The enthusiasts manual says that a socket can fit down in there…but, not on the 92. it looked like it might. So, I ground ANOTHER socket down to fit through the opening. 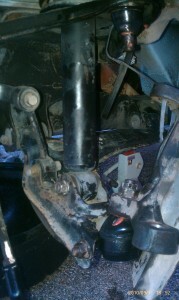 But, once I got it skinny enough it was still blocked by the lower shock mount. So, remove the lower shock bolt. Then I had to wedge the shock out of the way. 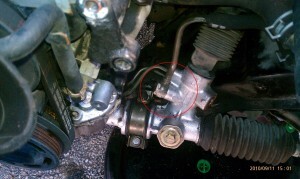 Remove the bolt….again, I WIN! Time to reverse course. A 1 1/8″ socket fits the upper dust boot perfectly. I filled it with redline CV-2, shoved it on and used a 4″ C-clamp to push it on. Slip the knuckle back over the stud, and tighten the nut to 29 ft-lbs…then tighten further until the castleated nut lines up with the cotter pin holes. The lower ball-joint is a little tougher. That’s because the upper arm springs up when the one of the ball-joints is released. Luckily, I’m also a woodworker, so I have quite a few bar clamps of various lengths. 24″ is just right. I used that to pull the arms back together. 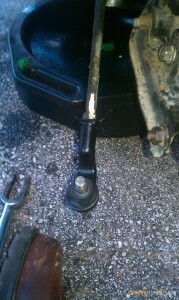 Same procedure to reassemble to lower ball joint as the upper ball. Below is the reassembled knuckle and ball-joints. Threaded the tie-rod end back onto the tie-rod. 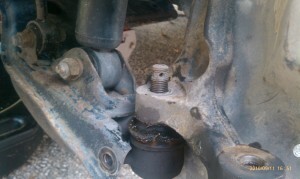 Notice the jam-nut is still lined up with the white-out on the tie-rod. Funny thing, the “white”-out is actually a tan-out. Its a tan color, not white. 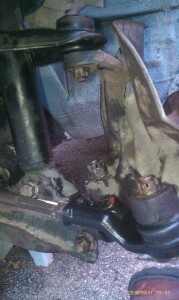 Again, same procedure as the upper and lower ball joints to reassemble the tie-rod with the steering knuckle. I need to get several cotter-pins. The ball-joints came with some, but I didn’t get any for the tie-rod, or the upper ball-joint. Easy enough to find locally. The finished assembly. Tomorrow…same thing on the passenger side. 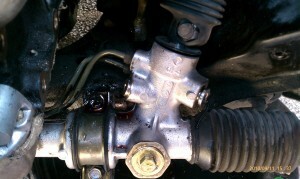 1 comment to Power steering, tie rods, and ball joints….oh, my! Wow, dude, great blog. I can see and understand perfectly and I have never seen a Miata. This is starting to look REAl!